Hi friends! How was your week? 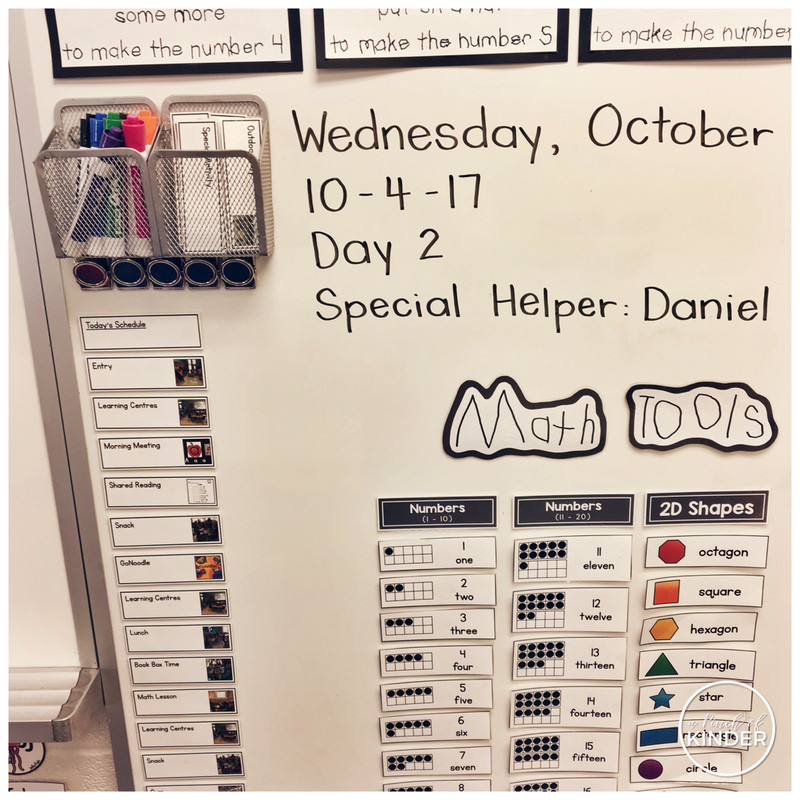 I'm back to share some of the new things we have been up to in our classroom! My kids have been asking me about their birthdays since the beginning of the year (When is my birthday? Is my birthday soon? etc.) so we finally made this birthday chart! First I had some of my SK's help me write the months, the title and the numbers for the dates we needed and I outlined them with a sharpie. Then I had the kids hold their birth date and we took pictures. Finally I printed the pictures and we sorted and glued them onto the correct month. 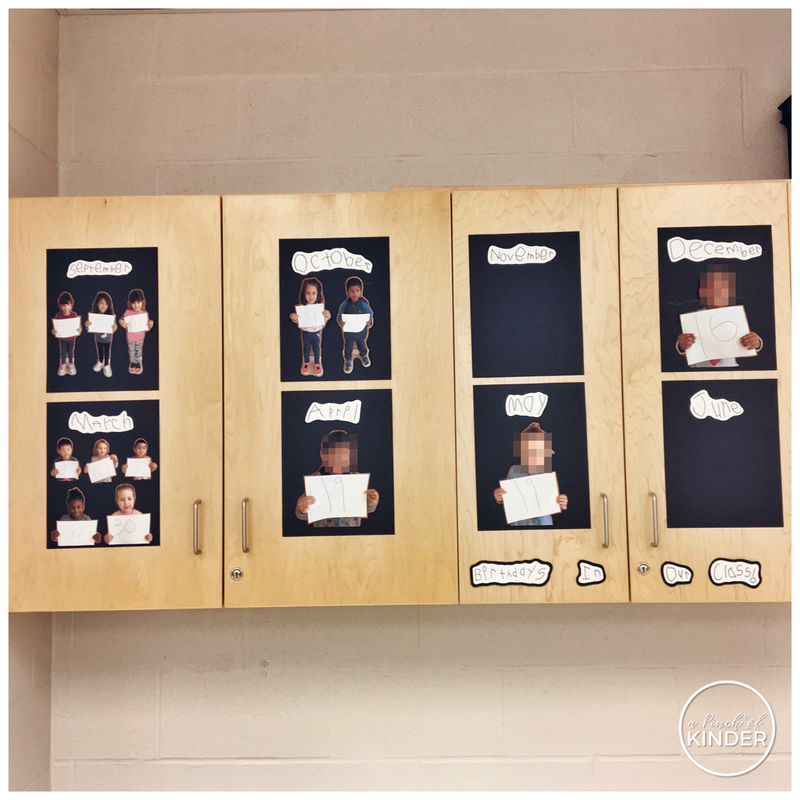 When we first put it up, the kids loved coming over to this area at centre time and talking about what they noticed! 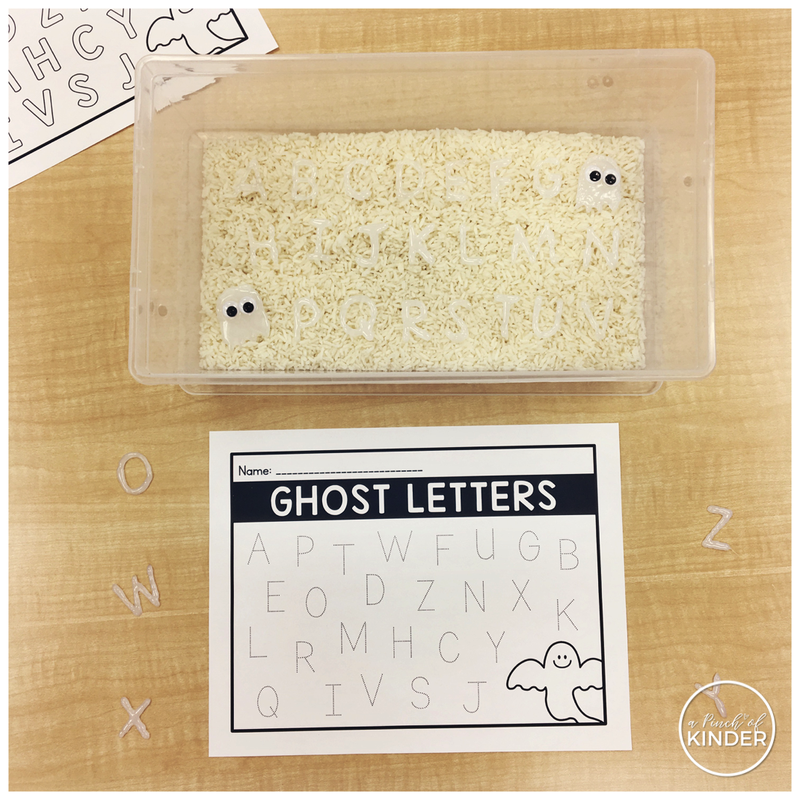 I got this adorable idea from my friend and co-worker, Amanda (you can check out her Instagram by clicking here). 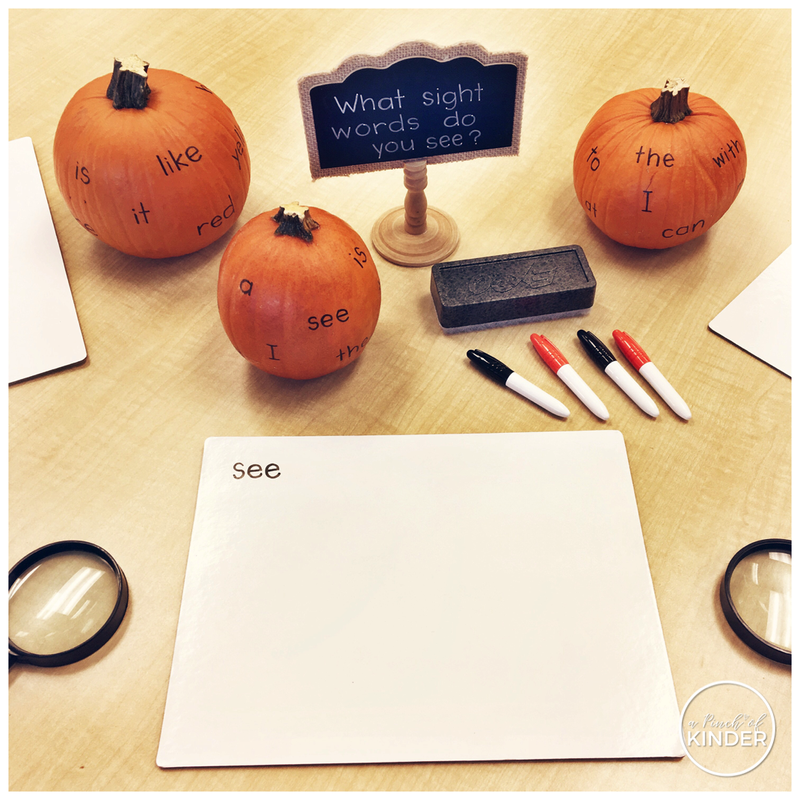 All you need to do for this centre is write some sight words on mini pumpkins and set them out with magnifying glasses, whiteboards and dry erase markers. Then invite the children to read and write the sight words they find! They loved this centre this week! 3. 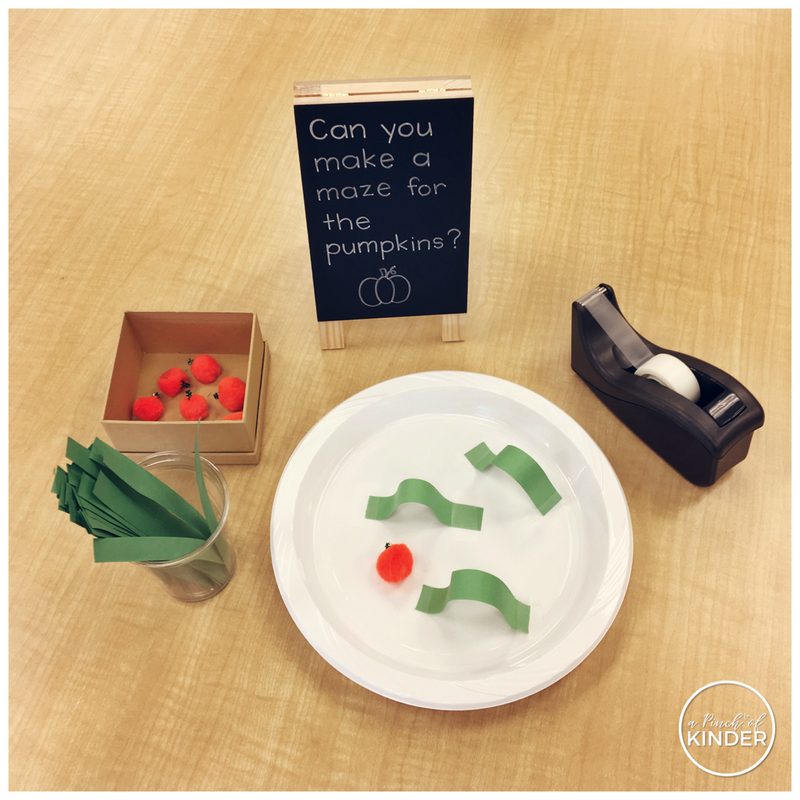 PUMPKIN STEM: CAN YOU MAKE A MAZE FOR THE PUMPKINS? I love STEM centres that work on 21st century skills like creativity and innovation! 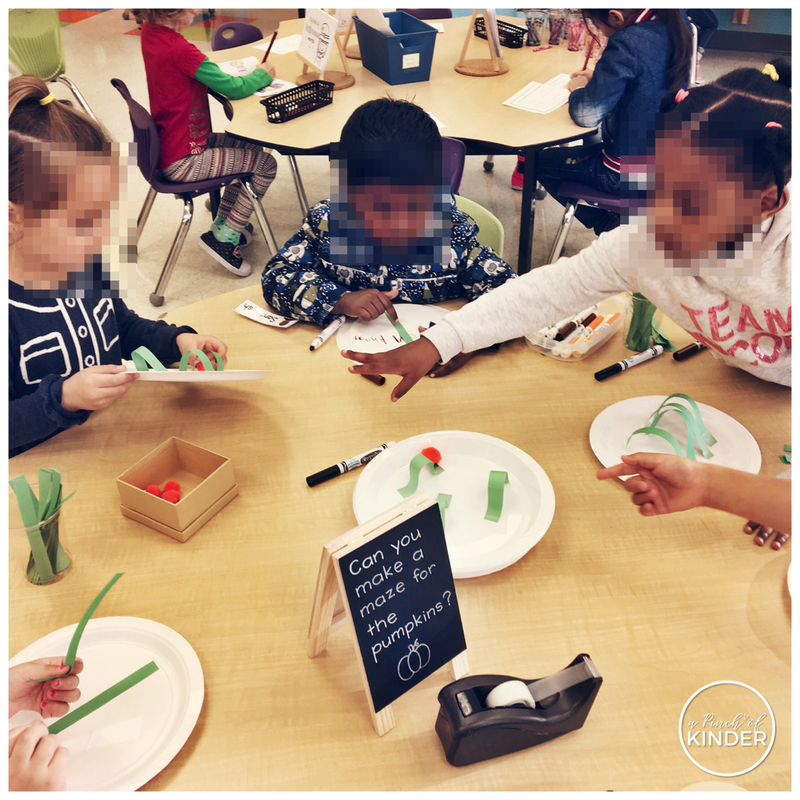 At this centre students were given paper/plastic plates, strips of green construction paper and tape and were asked to build a maze of the "pumpkins" (which are just orange pom poms with green pipe cleaners glued to them). Students experimented and problem-solved as they investigated how to make the loop, how to make bigger or smaller loops and fixing the loops when the pumpkins wouldn't fit through them. 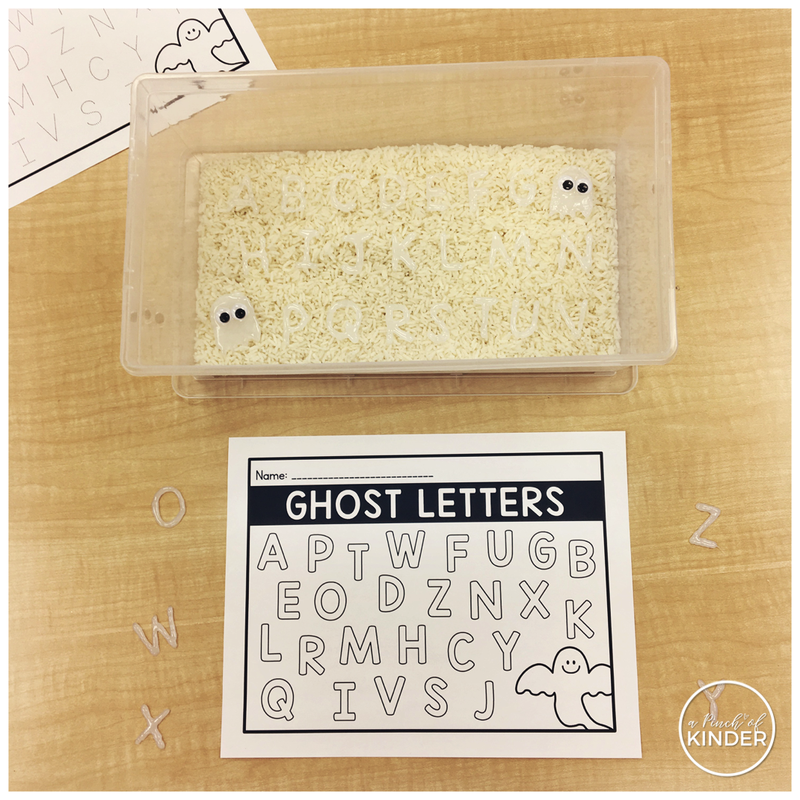 We saved the finished mazes and the kids got to play each other's mazes on Friday during centre time before they took them home! We are still working on patterning in math. 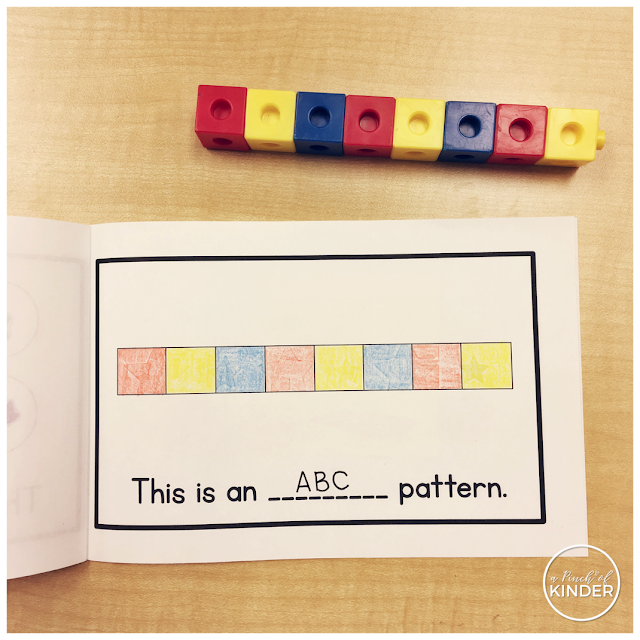 We continued to practice creating patterns with a variety of manipulatives in our pattern mini books! First we created patterns with these Halloween stamps (they are from Walmart and Dollarama). 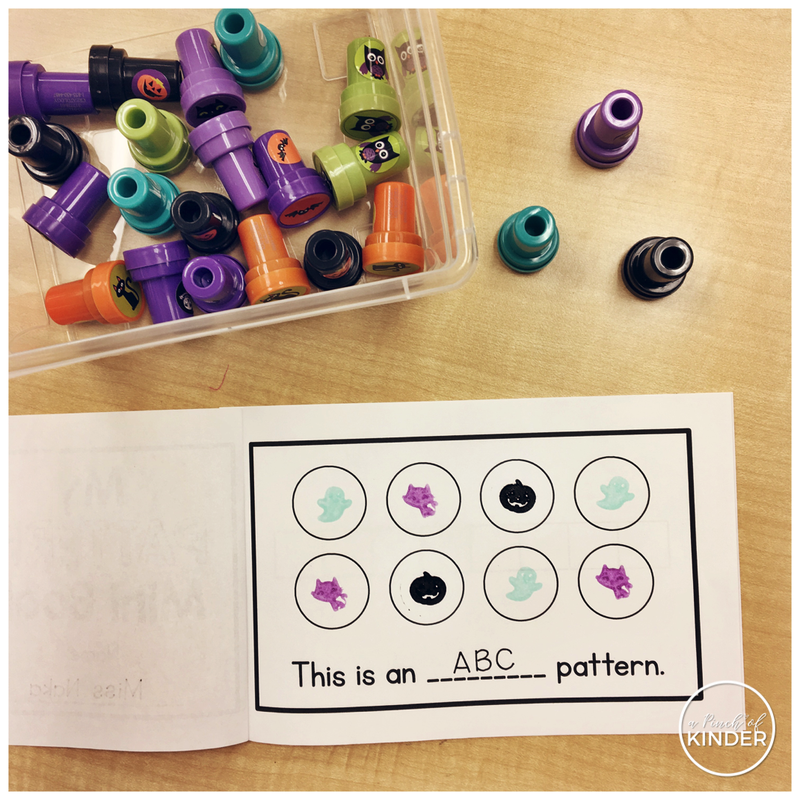 And finally we made patterns with stickers! I found keeping up with the booklets a little difficult as not all students had the stamina to complete so many pages, so I also just printed individual half pages and set them out at the corresponding centres! You can find the pattern booklet in my patterning unit. You can click here or on the image below to check it out! 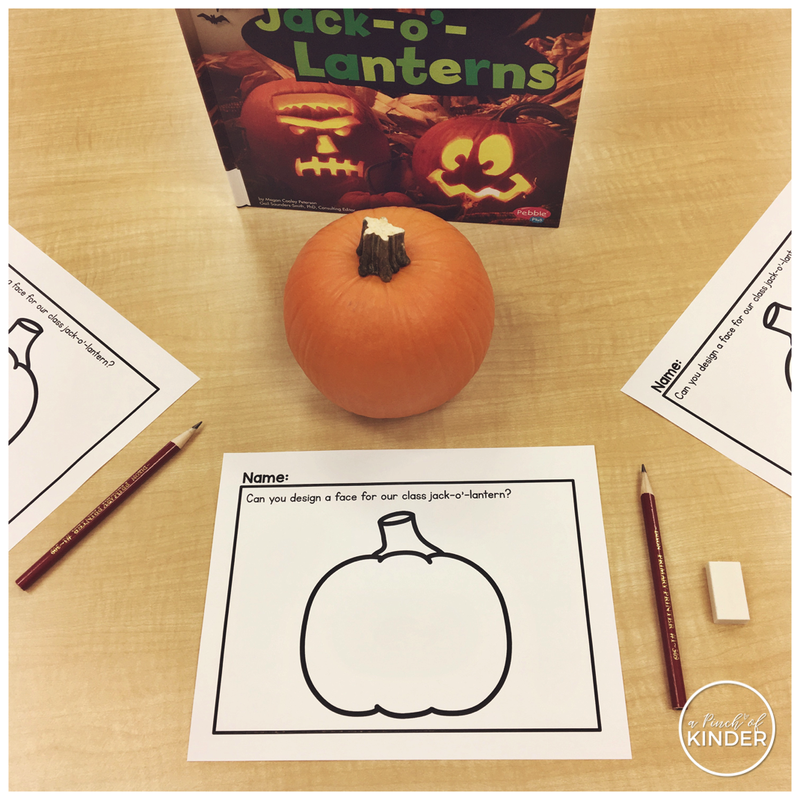 After we were finished searching for sight words on the mini pumpkins, I erased the sight words and set out this invitation for the kids to design a face for our class jack-o'-lantern. We will be voting on our favourite Monday morning and hopefully carving it Monday afternoon! 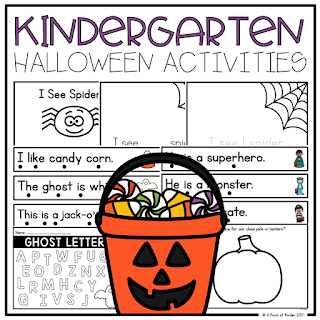 This printable is in my Kindergarten Halloween Activities pack on TpT. You can click here or click on the image below to grab it. That's it from me this week! Have a great weekend! I'm back with another weekly round up. Here are some things we have been up to in our room this week! 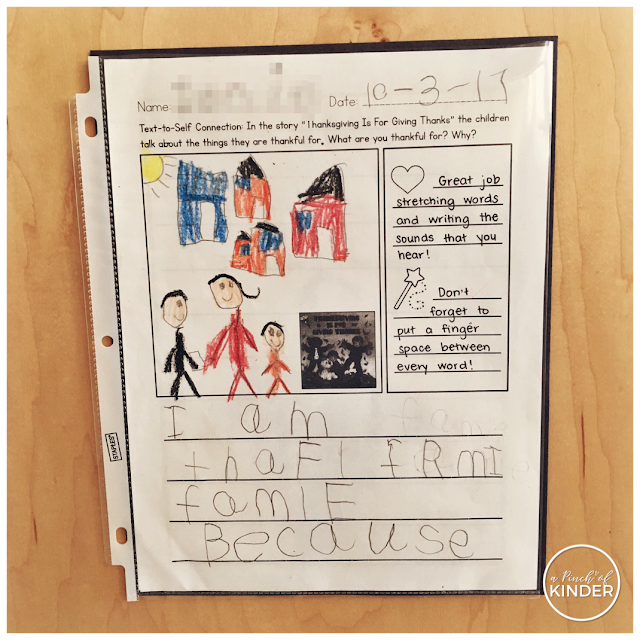 I found this adorable idea on Mom+3's blog and knew I had to make it for my kids too! You can click here to read the original blog post which has step by step instructions on how to make this centre. The letters are made out of hot glue. I printed off a sheet with letters on it, taped it to my desk and taped a piece of parchment paper over it. Then I went over the letters with hot glue. I freehanded the ghosts and added googly eyes while the glue was still hot. Then when it dried I peeled them off the parchment paper and put them in a bin with rice! The kids were invited to find a letter and then trace or colour the matching letter on their recording sheet. I provided both options so the kids could choose the option that was just right for them. I was having a hard time filling up both sides of this bookshelf weekly (I like to change up my books every Friday so that there is a fresh batch when they walk in on Monday morning) so I decided to do books on one side and store our clip board on the other side! 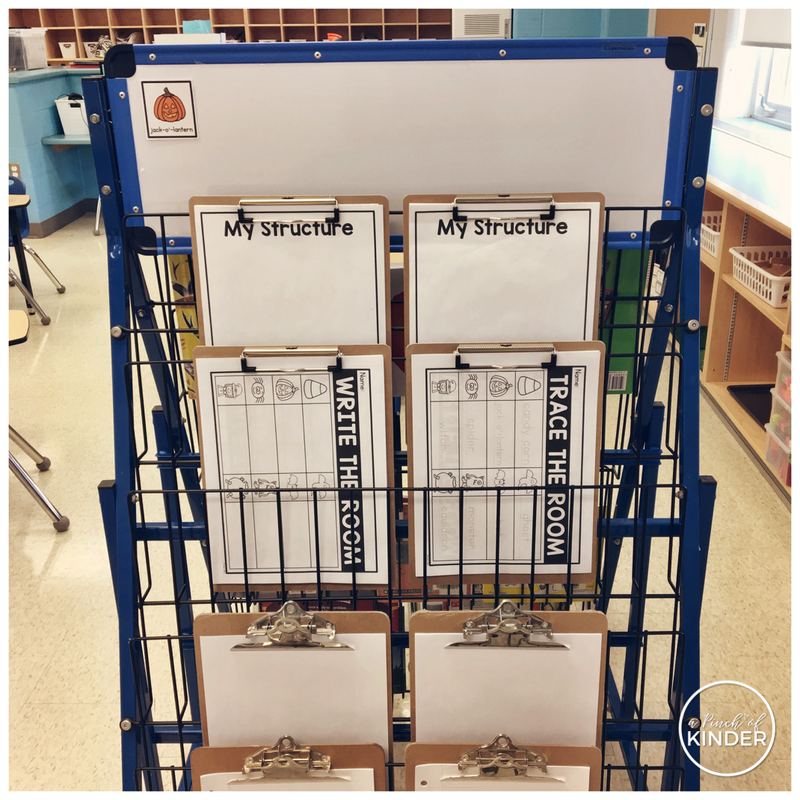 We have 2 with "My Structure" writing papers for recording their structures they make at the building centre, 2 with the "Write/Trace the Room" recording sheet of the week, 2 with blank paper and 2 with lined paper that they can use as they wish. I ordered these from the (Canadian) October Elf Scholastic flyers because the winter ones were such a hit with my kids last year! My new group loved them too and they were doing a great job using the stencils and adding details to their drawings. I also encouraged them to label their pictures (we have been working on this in our writing mini lessons) and adding a sentence below if they are able to! 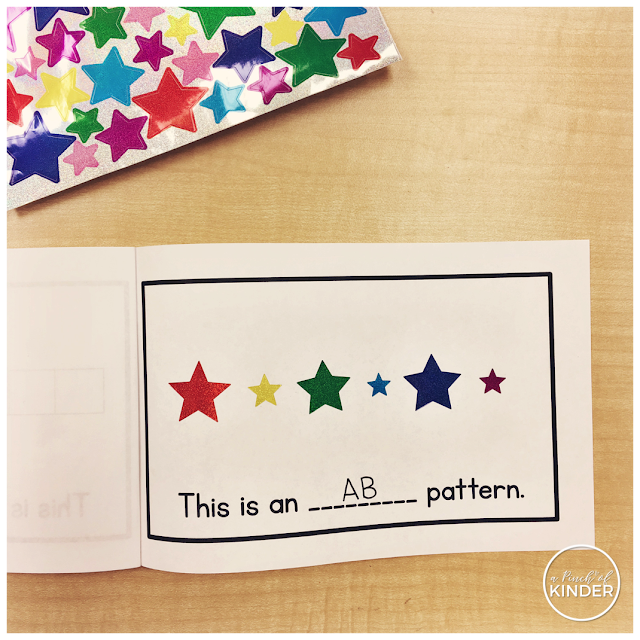 We started learning about patterning in math this week. I used (and will continue to use) lots of activities from previous years (click here for my post from 2015 and click here for my post from 2016). 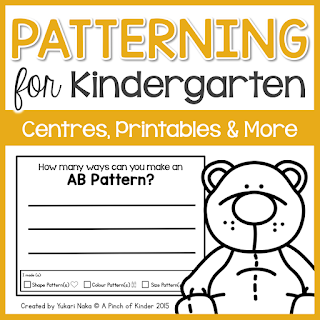 I updated these counting bear patterning cards with new clip art because my favourite clip art artist came out with the cutest counting bear clip art and well I'm a bit of a clip art snob. 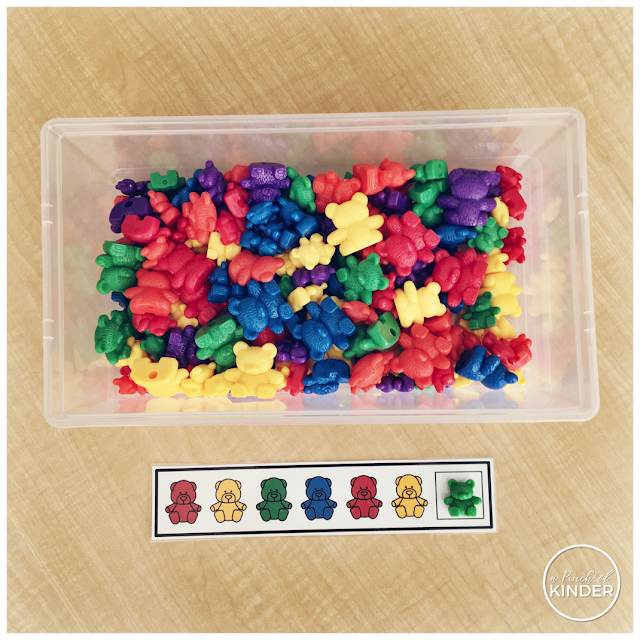 They are a great simple way to encourage patterning with counting bears and also a great way to assess if they can extend a pattern. 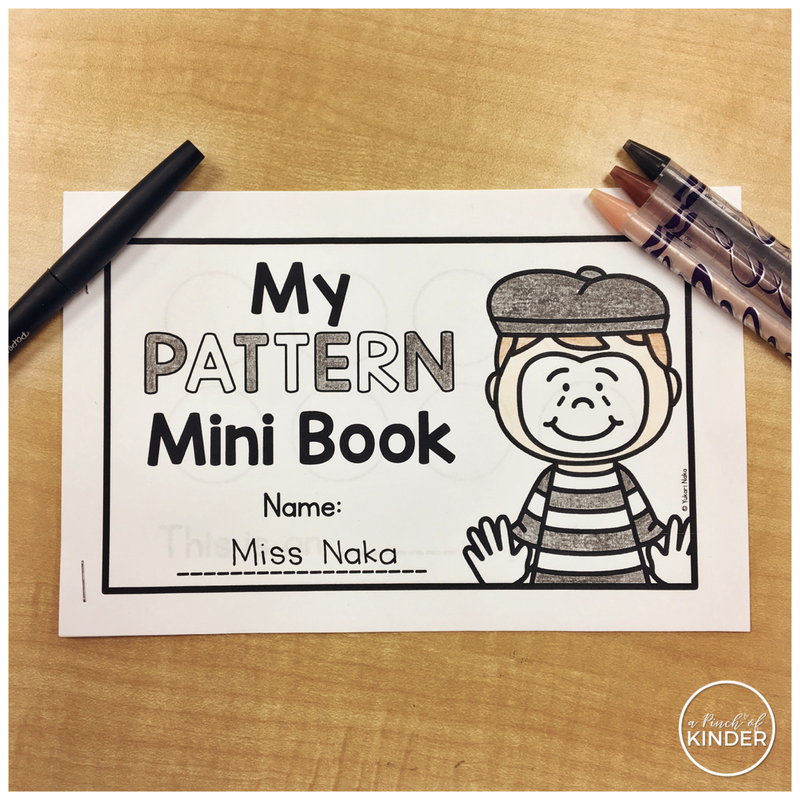 If you already own my patterning unit or the year long math bundle, the updated cards have been added. You can click here or on the image below to redownload the unit if you own it already! 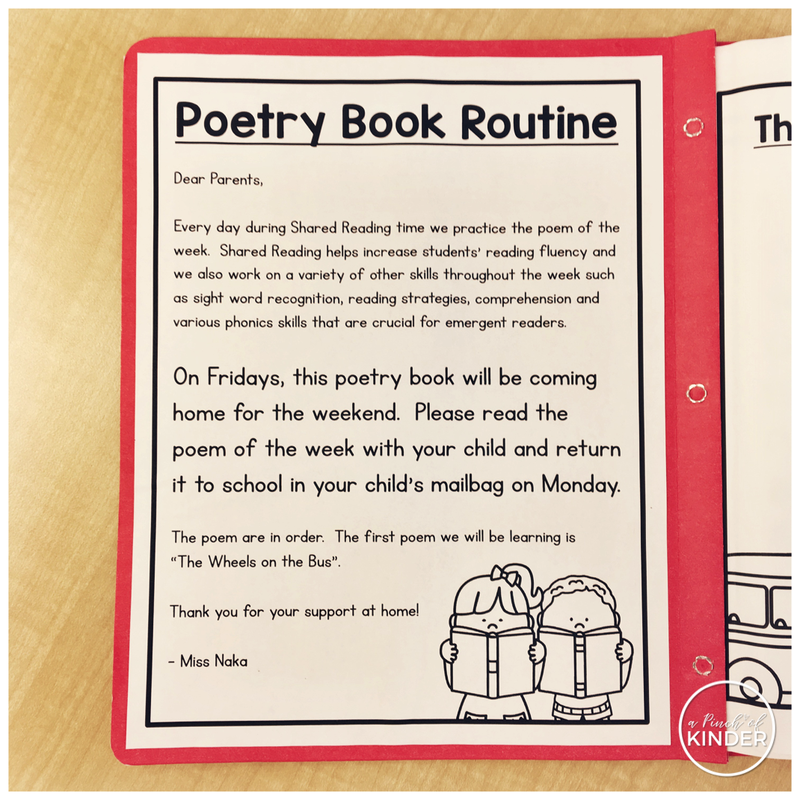 We've had out poetry routine going since week 2 but I'm finally getting around to sharing! Every day during Shared Reading time, we read the sight word poem of the week. I've shared in detail about our shared reading routine in this blog post, if you want to check it out. 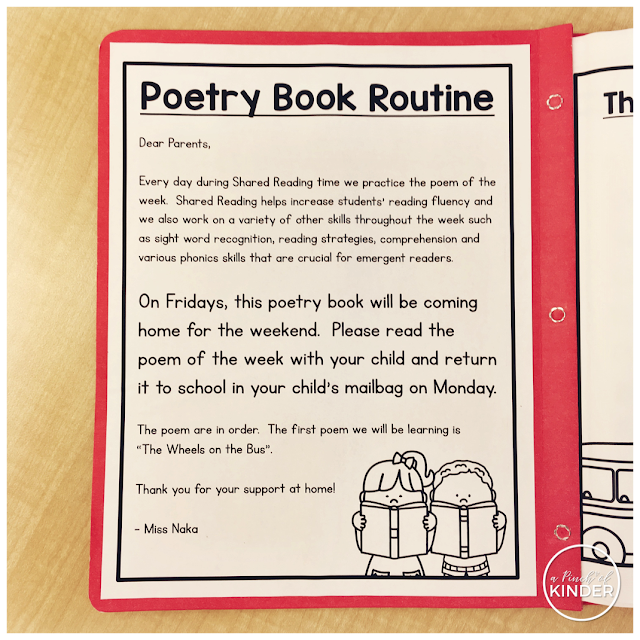 My new school sends the Shared Reading home over the weekend for the kids to share with their parents. So I quickly made up a note to go on the inside of our shared reading folder (which we call our poetry book). There are both non-editable and editable versions of both the labels and the letter in the file. You'll need PowerPoint to edit the files! That's it for me this week! 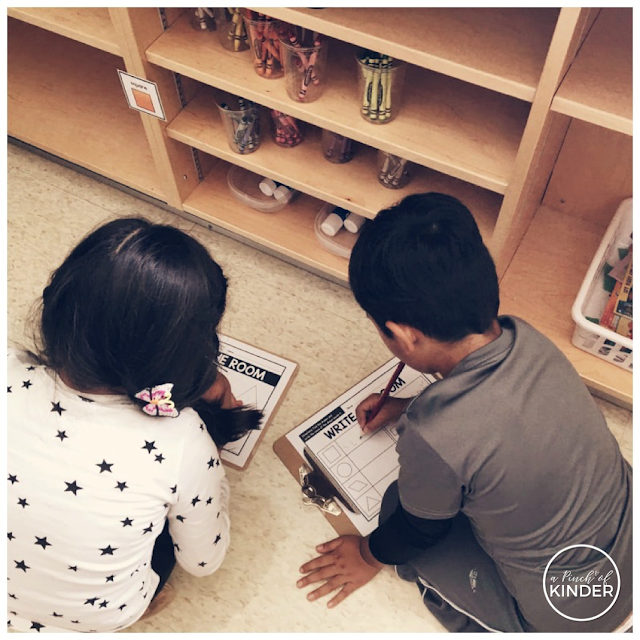 I hope you were able to grab some ideas to use in your own classroom! Hi friends! How's your October going? Truth be told I'm on a little bit of a #strugglebus. I just cannot get myself up as early as usual in the mornings and feel rushed everyday getting my room ready. 5:00 comes way too quick and I don't feel like I'm getting much done after school. Being sick since last Saturday doesn't help! I'm going to try to rest up this weekend so I'm ready to take on next week! Even though I'm not feeling the greatest my kids still did a great job learning and growing this week. Here is what we have been up to! 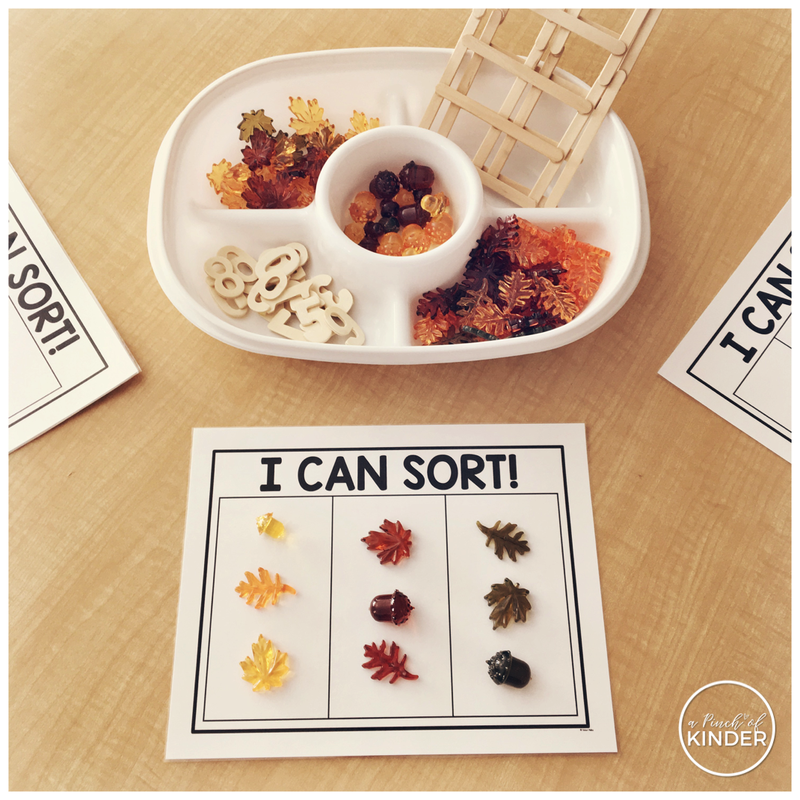 We started sorting this week (you can read my sorting post from last year by clicking here). 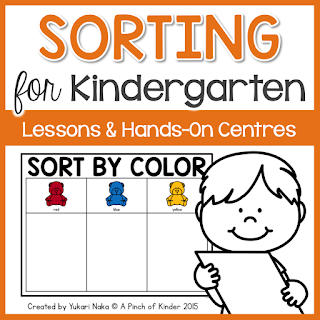 I did some whole group lessons and invited students to sort at a variety of centres. At this centre, I provided a variety of fall loose parts, wooden numbers and ten-frames with open-ended sorting mats where they can choose the sorting rule. 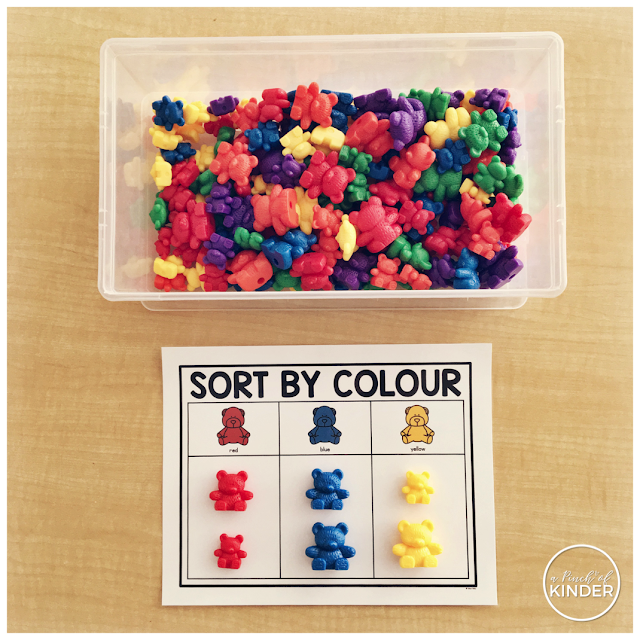 We also set out this sorting mat with counting bears after our sorting by colour lesson. 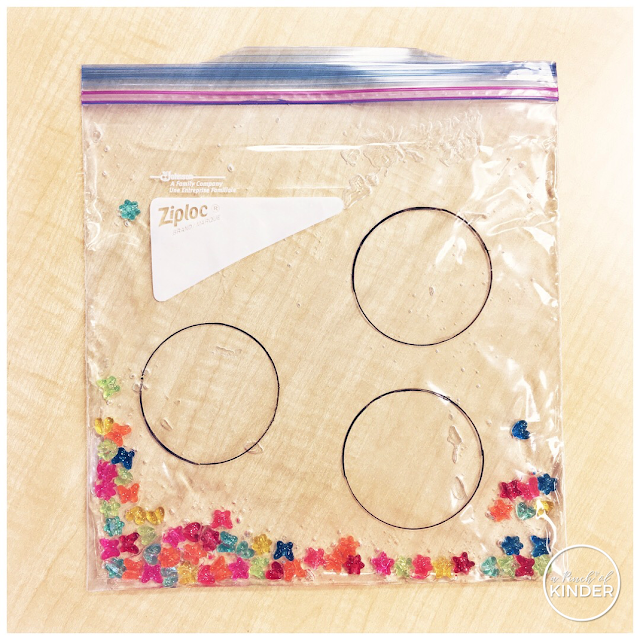 I originally saw these on Facebook and thought it would be the perfect way to introduce sensory bags and also incorporate our math focus, sorting! To make these I grabbed a large ziplock baggie, drew 3 circles on the bag with a Sharpie (I used the top of a cup for the circles), poured some shape beads into the bag and then squeezed some hand sanitizer in it. You can use clear hair gel too, but I found a big bottle of hand sanitizer for $3 at Dollarama so I went with that! Students were invited to choose a sorting rule and then squish the beads into the circles to match their chosen sorting rule. 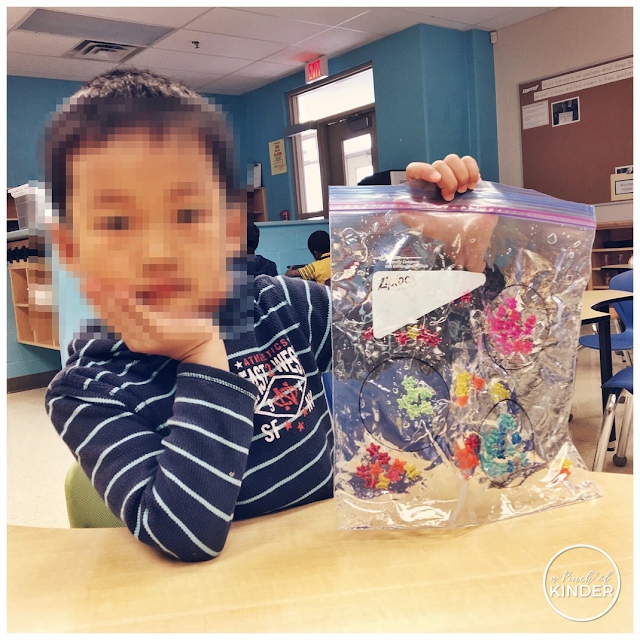 Here one of my boys is showing me how he sorted the beads by colour. So this is something I literally whipped up 10 minutes to the bell on Tuesday morning. 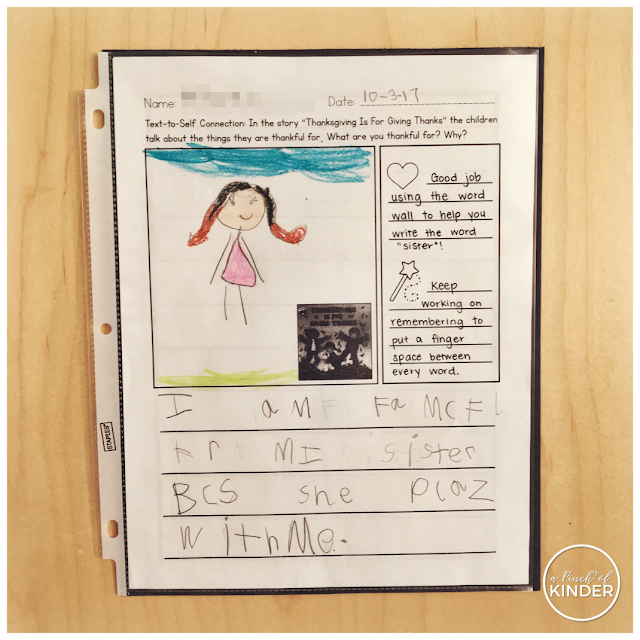 I figured the kids would want to share about their long weekend so I wrote the prompt "Draw and write about your long weekend!" and copied a bunch of these papers. Then I left them out on a table and told the kids that if they drew and write about it, they could share what they did with the class during our morning meeting. I'm not sure if it's the sharing bit that motivated them so much, but the kids were all about it! We got some great detailed pictures and some great independent writing as well! 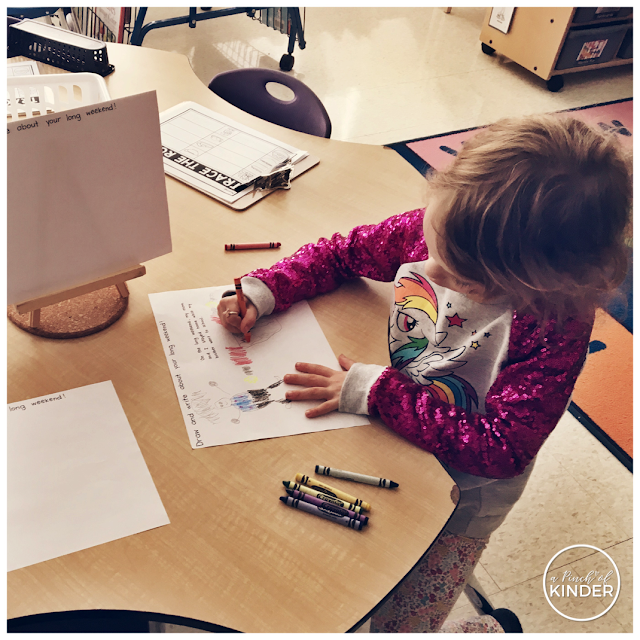 I don't have any student examples since I let them take it home after they shared their piece, but here an SK girl working hard on adding details to her picture! 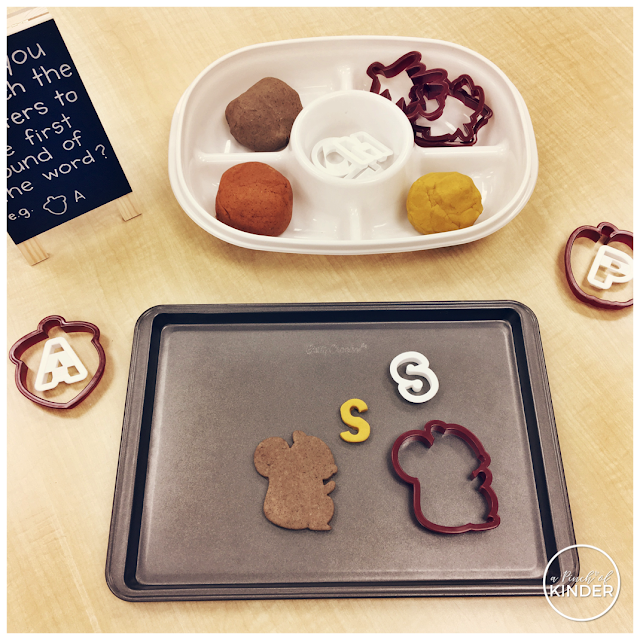 My kiddos love play dough this year so I thought I'd put a little twist on it and add the initial sound of each cookie cutter to the tray. 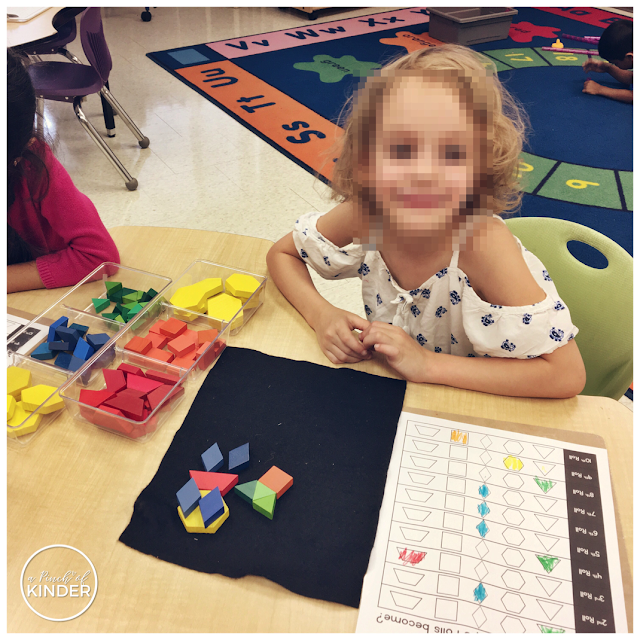 Then I invited the students to make the shape, say the word and find the first letter of the word. This is the invitation I put along with the play dough tray. The fall themed cookie cutters are from Dollar Tree. The alphabet cookie cutters are from an independent dollar store. The chalkboard is from Michaels. The chalk marker I use is the Bistro brand one from Michaels. 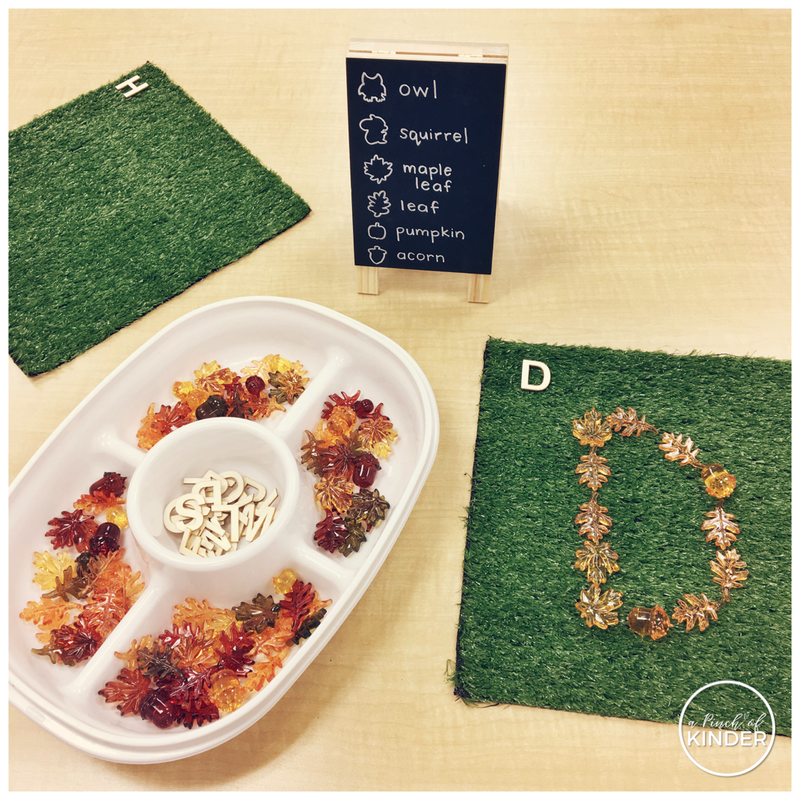 I also set out the loose parts (seen with the sorting mats for math above) during literacy centres and encouraged them to make letters. One of my students wanted to spell the whole word when he was working at the play dough centre (that was mentioned above) so I quickly drew the cutters and wrote the word beside them on the back of the board. I put this centre on the other side of the play dough centre so that if students were ready to make words, they could try to make some of the fall words on the chalkboard. I have such a sweet class this year. They are always making me pictures. I had started to tape some of it up on the cabinets behind my "desk" but we officially named it "The Fridge" this week. We talked about how when mom and/or dad are proud of something you have done, they will often put it on the fridge and that it will work in a similar way here. 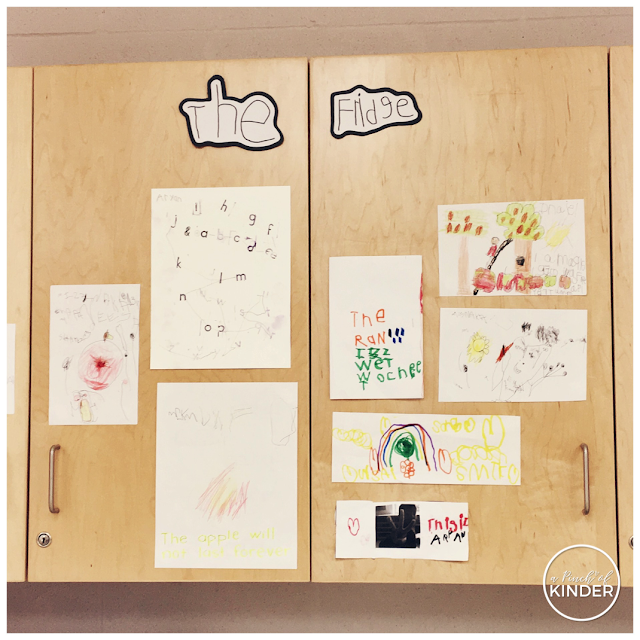 Students are encouraged to bring me their best work, work they are proud of, to display on "The Fridge". It goes up on the wall as long as they are proud of it and they can tell me what they drew/wrote. It's getting quite full already so I'm thinking about making a binder that says "Past work from The Fridge" and filing all the pictures in there once in a while. I'll also need to make a hand in basket as my desk was getting quite messy with all of their submissions thrown about! That's it from me this week! I hope there were some ideas you could use in your classroom. Have a great weekend! Hi friends! I'm back! 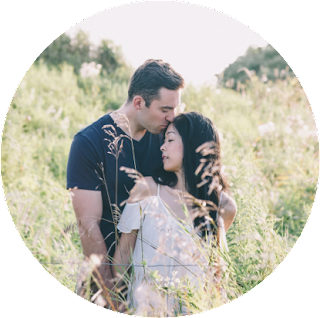 I took a week off most things "A Pinch of Kinder" last week so I could focus on my wedding! It turned out to be a gorgeous day (which we were so thankful for since we had an outdoor venue!). I'll share some photos when I get them back from our photographer! We actually started home reading last Monday. Students get these folders (I purchased these at Staples) in their book boxes (I use the IKEA FLYT magazine file for the book boxes). 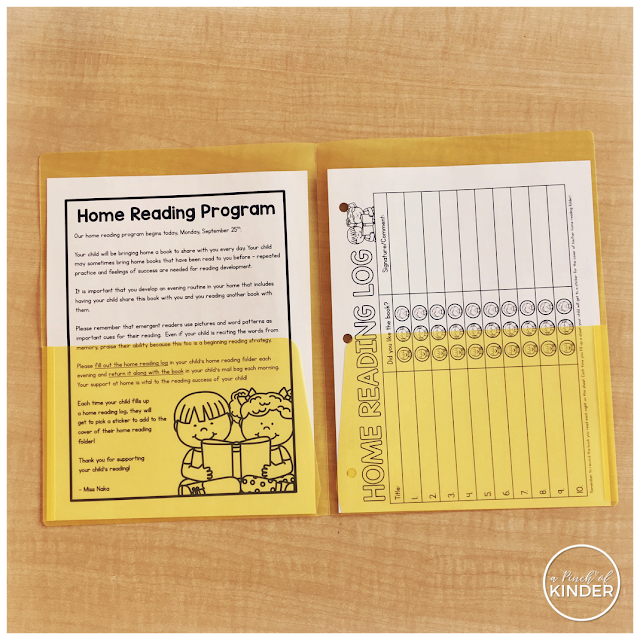 Inside I include the letter that explains the home reading program and a reading log. 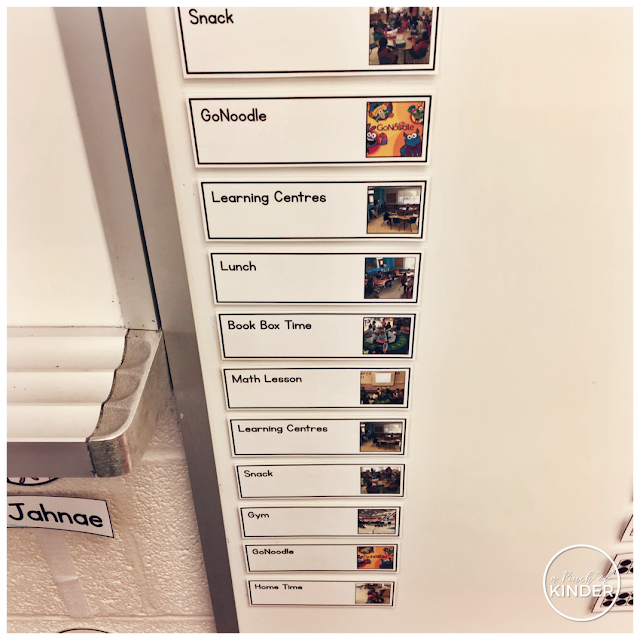 Students switch their books at book box time (independent reading time, after lunch recess) and place their home reading folder in their backpacks. 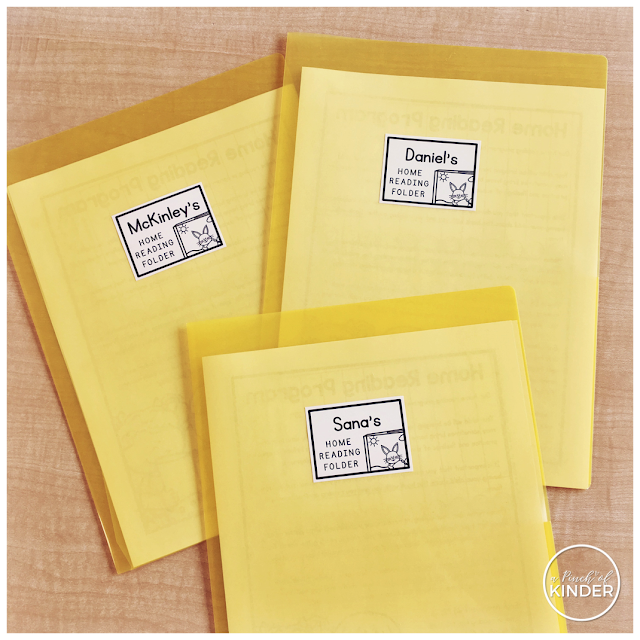 I put 5 levelled books in their book boxes at their reading level each week. Students are welcomed to take home the same home twice if they wish. When they bring their home reading folders back in the morning I have them put it in a bin. 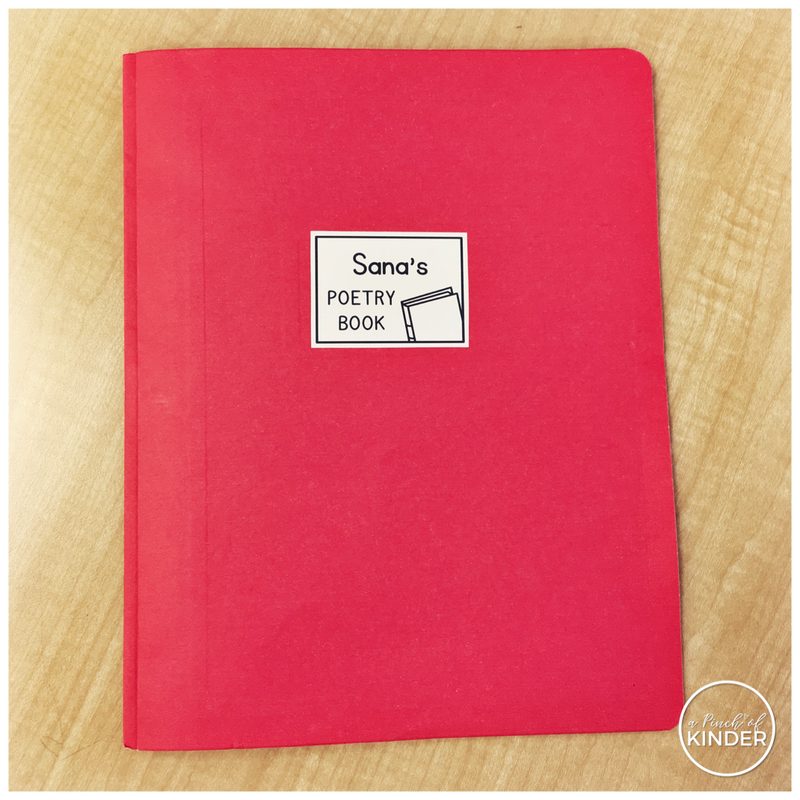 Once all home reading folders are handed in, I quickly check for notes and have one of my responsible SK's put them in the book boxes for me. Once they fill up a reading log they get to choose a sticker to add to the cover or back of their home reading folder. In the past we also let students choose items from a treasure box (my old school provided the treasure box, this year I'm doing stickers because I don't have enough items to fill a treasure box myself). 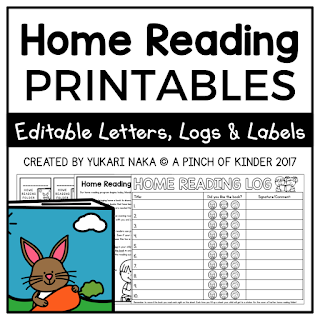 When I asked on Instagram, a lot of you were interested in seeing the home reading printables in my TPT store so I have put them up. You can click here or on the image below to grab them if you are interested! I got the idea for this centre from @ourkindergartenfamily's Instagram account. First we read the book "Shape Shift" by Joyce Hesselberth. Then, students roll the shape dice 10 times. They colour the shape they rolled after each roll. 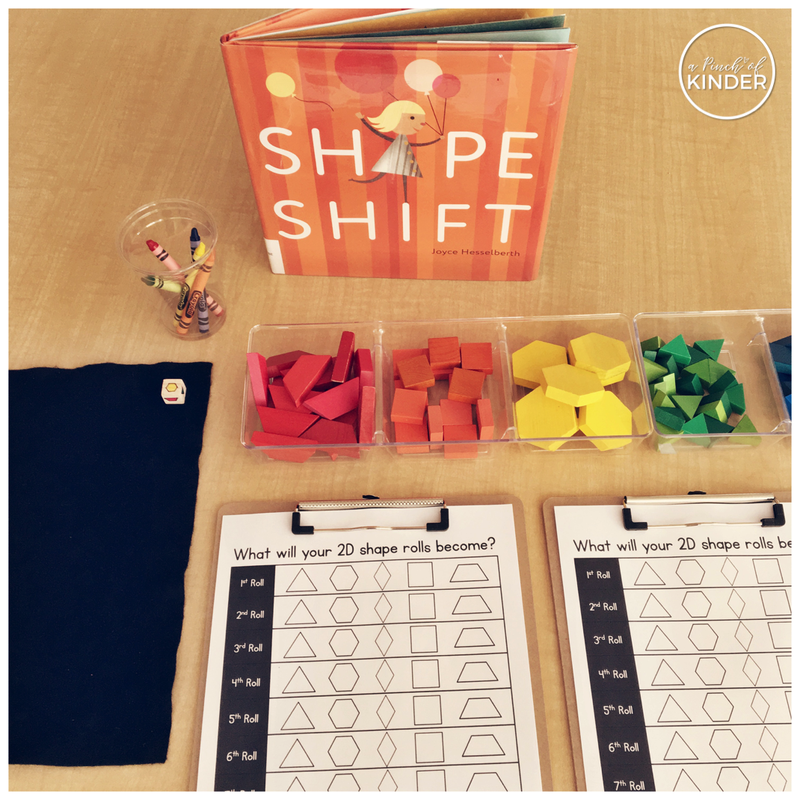 After they have rolled 10 times, they collect the 10 shapes they rolled and make a picture using the 10 shapes. This activity practices so many skills, such as following directions, ordinal numbers and fosters creativity and imagination! 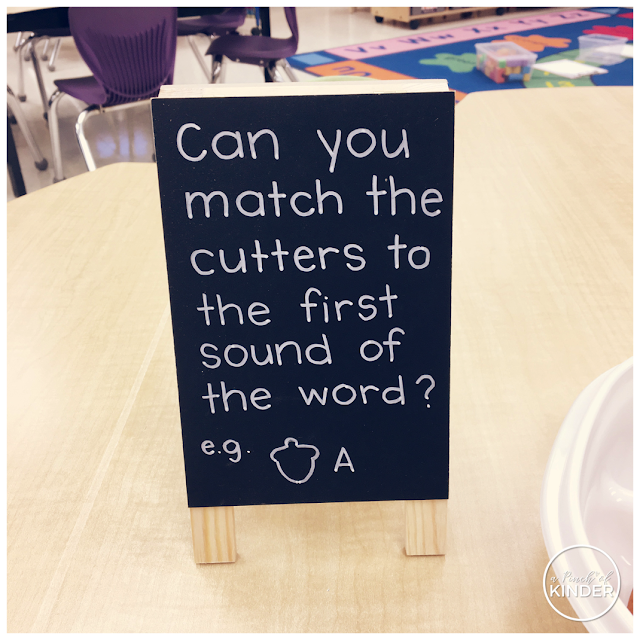 I love activities that promote higher level thinking! This girl told me she made a girl walking her dog. 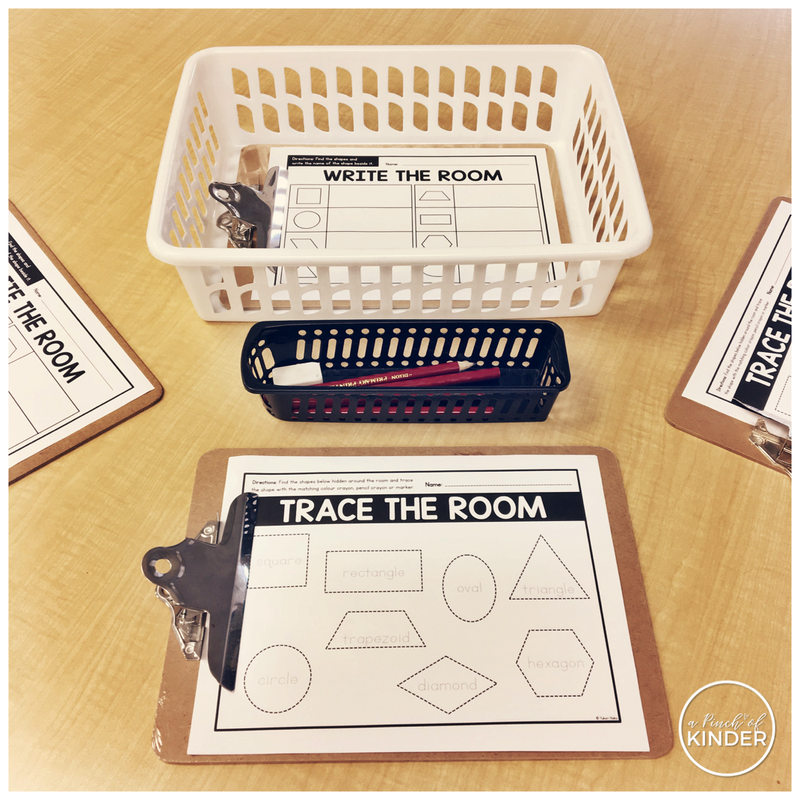 This week we continued to work on identifying, describing and comparing 2D shapes so I also introduced this 2D shape trace/write the room and the kiddos LOVED it. 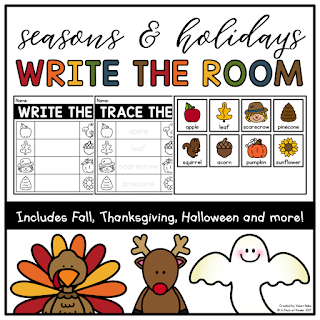 My group last year had no interest in write the room but so far this group is all about it. I had the students pick the sheet that was "just right" for them (not too easy and not too hard). The kids were instructed to find the shape cards that were taped around the room (there were 8) and either trace the matching shape or write the shape word beside the shape on their paper. I also encouraged them to colour the shape the same colour as the shape on the cards. You can find this 2D shape write the room activity in my 2D shape unit on TPT here. 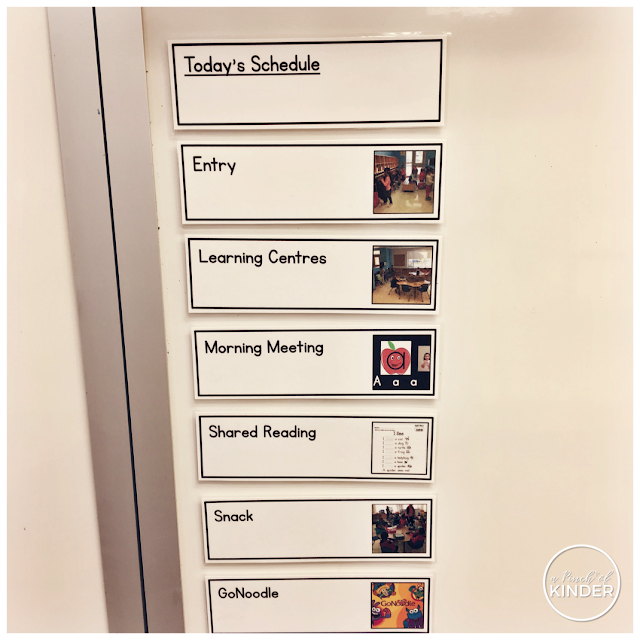 I've always had a visual daily schedule displayed for the students. For me it's a serious sanity saver. I get less questions like "When is it home time?" or "Do we have gym today?" I just point to the schedule and say "Go check the schedule!" and they go and check themselves. After a few times, they learn to check it themselves before they come to me. This is my second year using this template. I had someone on Instagram DM me and ask me for the template. Since I made an editable template to share wit her, I thought I would share it here as well. 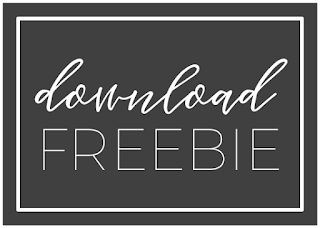 You will have to take your own photos but if you would like the editable template, you can click here or on the image below to download it! You will need PowerPoint to edit the file. We started our October guided writing this week! 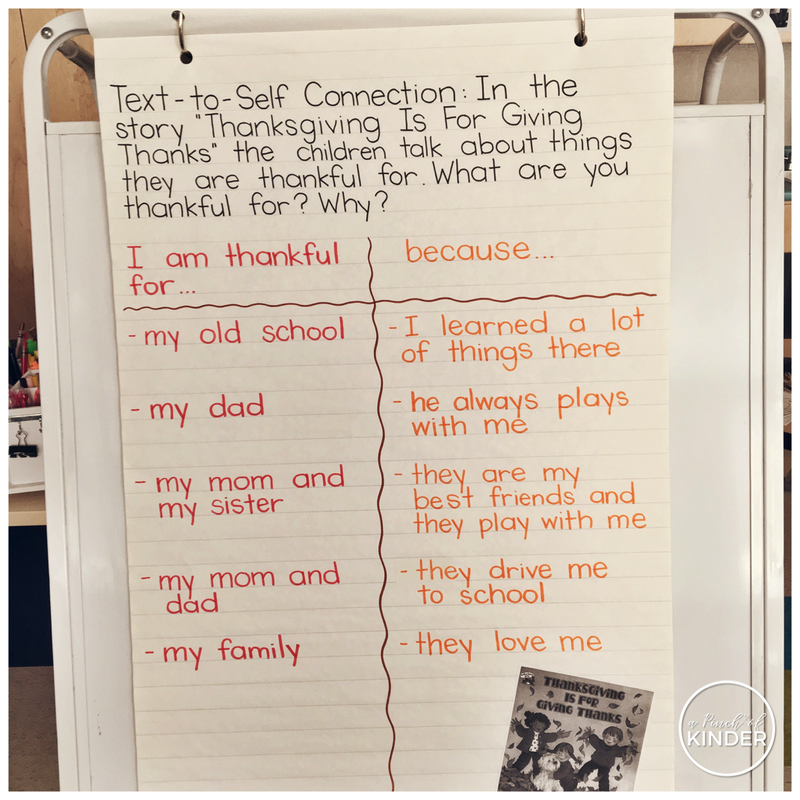 We read the book "Thanksgiving Is For Giving Thanks" by Margaret Sutherland and wrote about what we are thankful for. 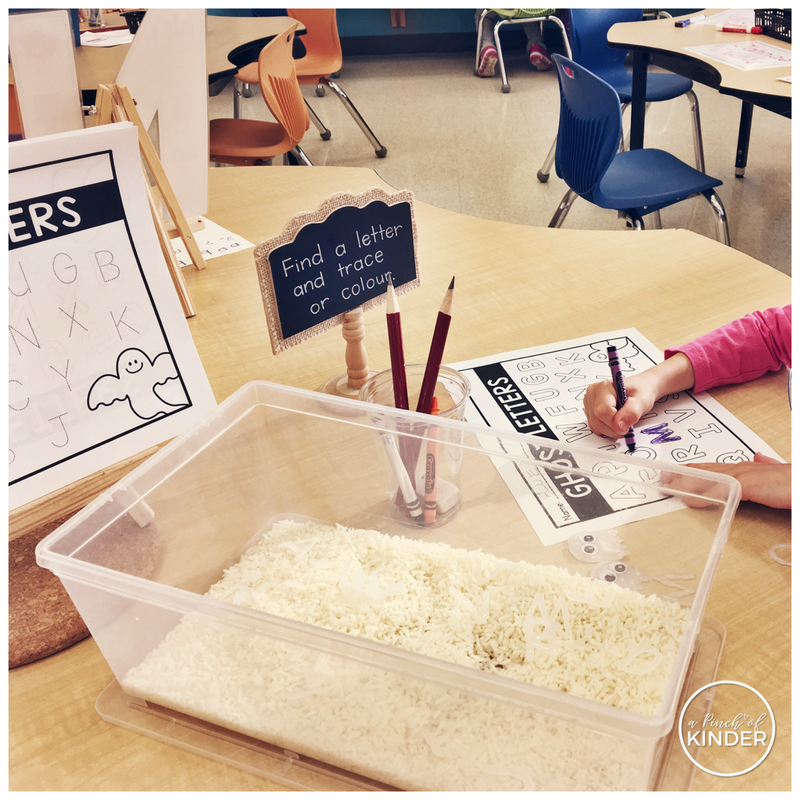 Then we wrote our own on the writing paper! "I am thankful for my family because they love me." "I am thankful for my sister because she plays with me." 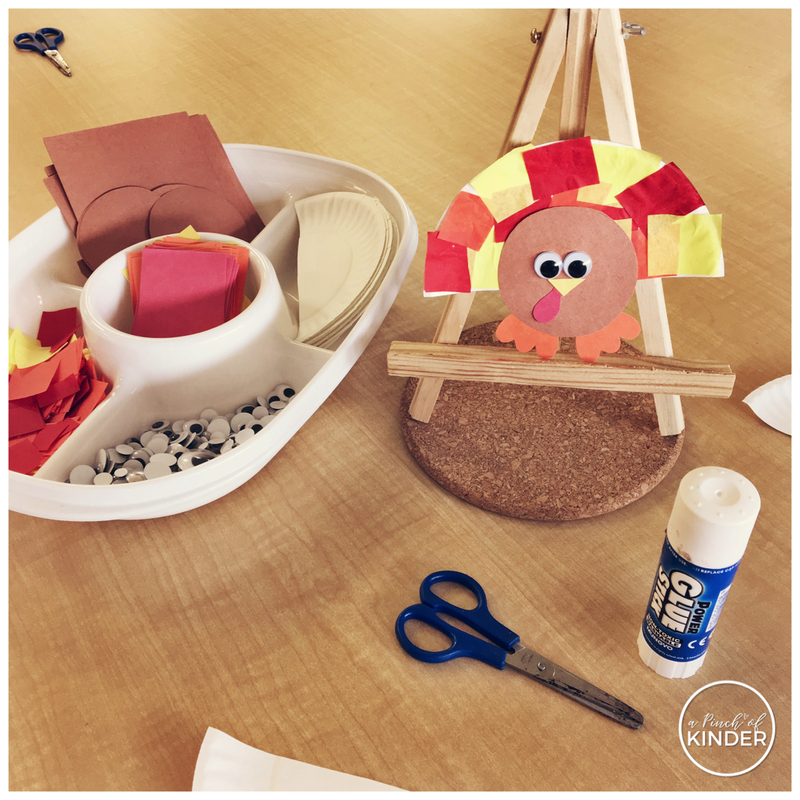 I set out this invitation to create a turkey at the art table this week. 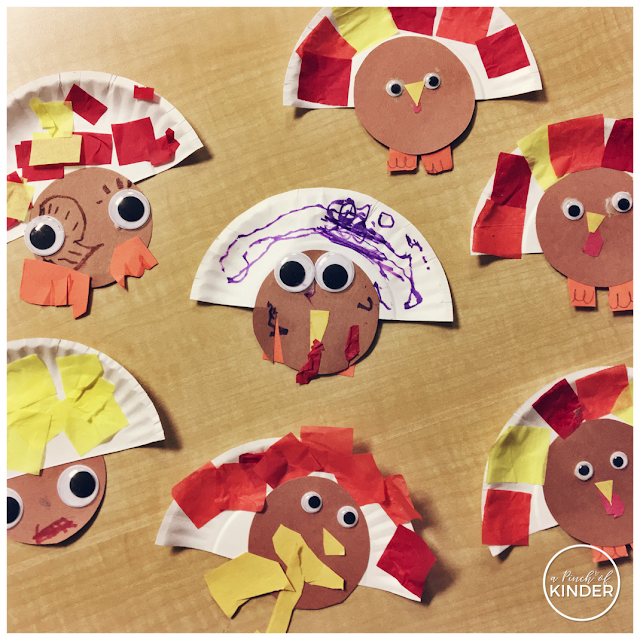 The kiddos did a great job creating their own turkeys! Below is the sample I made that I left out for the kids to look at. I provided them with paper plates cut in half, googly eyes, tissue paper cut into squares and brown, red, orange and yellow construction paper cut into squares. I had some brown paper cut into circles and some I left square so that kids who choose to could cut their own circle or a different shape for their turkey bodies. Here are some of the finished turkeys! Love how they all turned out so unique! Our sensory table finally arrived this week! I kept the first one simple and filled it with corn kernals, a variety of fall items (all items found at Dollarama), wooden letters (also Dollarama) and clipboards. The kids were so engaged in their play here! 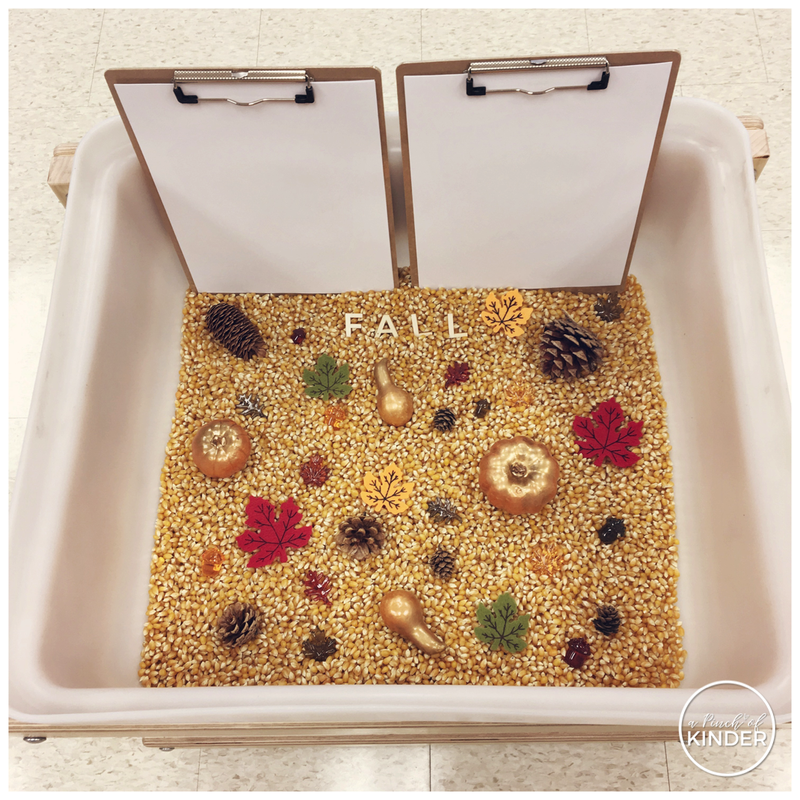 They only had one centre block to play with this sensory bin so many students are looking forward to exploring it next week! 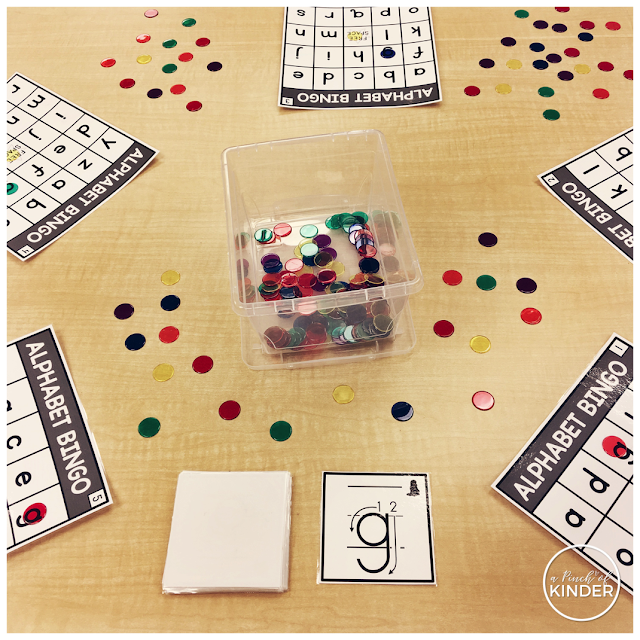 I had two Grade 6 kiddos visiting my room for 2 days this week (they didn't go on the field trip) so it was the perfect time to bring out my new Alphabet Bingo! As always, the kids loved playing bingo and the Grade 6's lead the game. Once they got a line they got to pick a sticker! You can grab these bingo cards in my TPT store here. The calling cards you see in the photo above are NOT included in the bingo product (there are simple calling cards that are included in the bingo product but they are not the ones pictured above). I already had these cards printed and laminated so I used them as my calling cards. 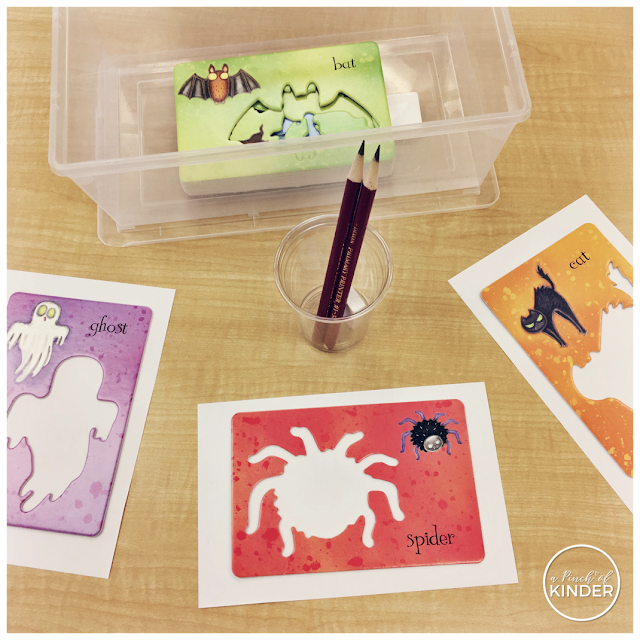 The letter cards pictured above are the Letter Formation Flash Cards. You can find them in my TPT store here. That's it for me this week! We have a PA Day tomorrow (PD in the morning, staff meeting at my school in the afternoon) and then we have a long weekend for Thanksgiving. If you are in Canada too, Happy Thanksgiving long weekend!